Title: All electromagnetic equations: The same as all fluid dynamics equations, but with the 8 and 23 replaced with the permittivity and permeability of free space, respectively. I feel like the fluid dynamics equations needs an outer product of the gradient operator or something. Last edited by gmalivuk on Fri Aug 17, 2018 10:47 pm UTC, edited 1 time in total. I'm not sure all the equations would fit on a T-shirt, but they would definitely fit as a full-body tattoo. Is the `truly deep physics equations` just because of the simple formulas that involve the planck constant or is there something else? H_hat is a Hamiltonian (perhaps even a general differential operator), not Planck's constant. I'm fairly sure it is that, but it slightly out-geeks me. 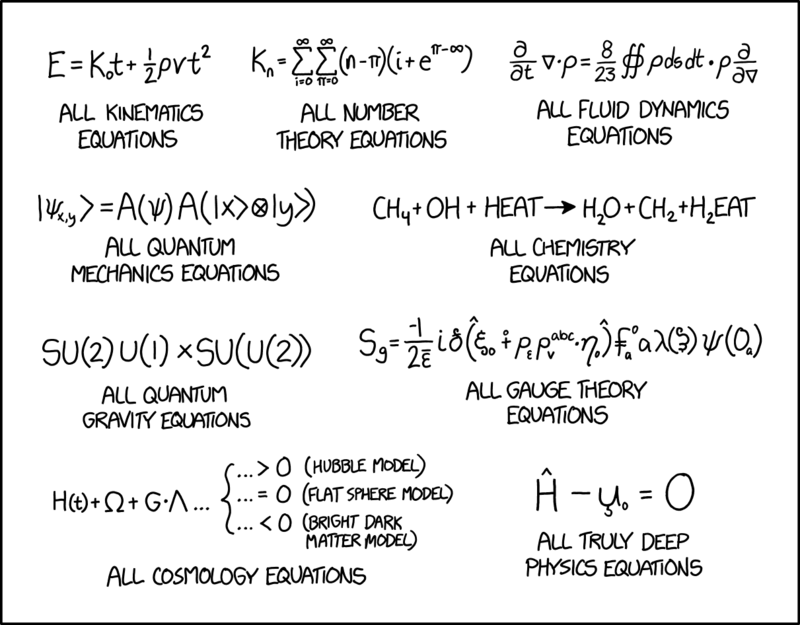 I think I'm going to wait for the explainXKCD article to come up, then I'm going to re-enroll in college to see if Fluids, Thermodynamics, and Fields classes get any easier. I didn't realize we knew enough about quantum gravity to actually have equations for it. ...or is that just ((representative of) | (a parody of)) a string theory equation? I'm still not much the wiser! SuperCow wrote: I didn't realize we knew enough about quantum gravity to actually have equations for it. We don't, at least not ones that belong to a generally accepted theory. SU(n) and U(n) each indicate a vector space (and certain operations) where each vector has n numbers. Nesting them doesn't make sense because 1) n needs to be an integer 2) n would typically be a specific fixed, small number, as these are less functions than a way to describe what kind of mathematical object we're using. Those numbers look like someone took the number space for Grand Unified Theory (electromagnetism + weak force + strong force) and made them more complicated, as if they were adding gravity to the mix. Also, that "quantum gravity" expression... actually, several of the things on this... are not even equations. It's not an equation without an equals sign. I'm pretty sure the joke about quantim gravity is that there are no equations at all, just some symmetry groups. beojan wrote: H_hat is a Hamiltonian (perhaps even a general differential operator), not Planck's constant. Because as any fule kno, Alexander Hamilton was most famous for wearing hats. The chemistry equations author was pre-med until he/she wrote the equation. I'm highly suspicious that the "Deep Physics Equation" MUST be normalized to read "= 42", or it won't work. Number theory itself produces gravity waves, so there's a nesting that ought to be taken into account. Number theory is your momma? Given the complexity of many formulae in modern physics, mathematics, etc. and the wide availability of Unicode I'm surprised we haven't gone beyond the standard greek/latin alphabet yet, instead choosing to use diacritics, typeface styles such as blackletter etc. gcgcgcgc wrote: Given the complexity of many formulae in modern physics, mathematics, etc. and the wide availability of Unicode I'm surprised we haven't gone beyond the standard greek/latin alphabet yet, instead choosing to use diacritics, typeface styles such as blackletter etc. Mathematics has ventured into the Arabic alphabet in a few places - such as Alephs for cardinal infinities. Aleph is Hebrew, not Arabic. All the standard numerals are Arabic, though. (Unless you ask an actual Arab, then they're Indian). Well, I had friends with absolutely no aptitude for drawing and professor handwriting isn't known to produce easily legible greek letters. Based on those two experiences, I would not venture to read any handwritten calculations with tiny cars and chinese logograms in them, but have fun trying. Pfhorrest wrote: Aleph is Hebrew, not Arabic. Good point. The first two letters of the Arabic alphabet are also called "aleph" and "beth" (both with a variety of transliterations), but look very different. I am not sure that we are supposed to take this one seriously, at least not literally. Secrets of the Universe indeed... 42 belongs there somewhere. And, so damn it... where are the pyramids in all of this? I think we should start using digammas for functions. Using the Arabic aleph would confuse people, because it's just I sloping the other way. I still hope Doctor Who runs out of letters at the ends of Greek and Roman alphabets and starts using the Arabic one, though, because watching the cast try to maintain straight faces while talking about how long the ha-shielded windows will protect them from the 100% wow-tonic environment while the engineers are repairing the yay-drive could make the show worth watching. SpitValve wrote: I think we should start using digammas for functions. Well, in a way, we already do - though that particular digamma is actually coincidental! There is also one known use of Cyrillic: Ш is the Tate-Shafarevich group (and a few other things, apparently, but this particular use is definitely the Cyrillic letter). I think it's missing the most fundamental equation "f(x) = g(x)". If you want that in a prose form... "everything can be divided into two categories - those things that can be divided into two categories, and those that can't". My prose interpretation of that is "an empty set is not equal to an empty set," which doesn't sound like an important equation, but rather, it sounds wrong. It depends on who you are defining things and which axioms you pick. Within ZFC that's wrong, but it's probably true in some formulations of set theory which don't assume an excluded middle (P doesn't necessarily equal ~~P).